These pliers are specially designed with its jaws ground to a special shape for ease of preparation when making glass knives. These set of jigs assist in the production of making glass knives by hand. T-square jig: when the edge of this jig is placed against the edge of the glass knife strip the subsequent score will be 26 mm or 1" long. After breaking, the square of the glass can be scored at a 45 degree angle by using the other jig. Metal parts are made from nickel-plated brass, set into a maple handle. The rack can be used to crack single or double strength glass. A repair kit for the LKB Knifemaker. These Knives will fit most any ultramicrotomes and take the place of using glass knives . Perfect for trimming blocks, block facing, and for sectioning hard samples. The quality does compare to glass knives and these blades can be resharpened if desired. Note: This unit is not a safe device to store your sectioning knives, such as diamond or glass knives, after you're finished with the sectioning. Inexpensive, expandable finger cots. Seamless. Protective dexterity without covering the entire hand. Powderless, non-rolled. 3 ½mil (0.0030"), 2 ¾"(40mm)L.
Since most of the EM labs already have stirring plates, the Diamond Knife Wash has been designed for use with your existing unit, saving you the need to purchase an extra one. It is universal and can be used for all type and brands of Diamond Knives, including the Diatome Histo Knife. Warning: Never use on a hot plate. If used on a combination Stirrer/Hot Plate, make sure the heat is off. Pink wax is a hard and thick wax sheet that is ideal for mincing and cutting tissues. Red wax is no longer available. Approximately 31 to 35 sheets per pound. This portable heat pen is able to heat up to 700°C and automatically recharges every time it is placed back into its recharging stand. It will last approximately 40 minutes on a full charge. Tip length 1". 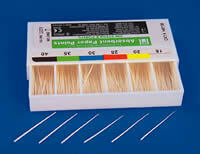 It is useful for the sealing of wax onto glass knife boats and small soldering jobs around the lab. The set includes the heat pen and recharging stand. Used for sealing the boats made from tape to the glass knives. Machine rolled paper with a tapered end which offers good water absorbency, and assists you in the removal of surplus water from the knife boat, on the block face, and from the grids. These disposable plastic boats which easily attach to the triangular glass knife making a trough. To use: Simply slip the boat on the glass knife back and seal with either hot melted wax or nail polish. These boats are made from aluminum and are anodized black. They come complete with a set screw on one side. The area where the glass knife will be attached, is cut to fit to the width of the knife and is cushioned by silicone rubber to ensure a tight seal and no leakage. Made from human hair; good for removing sections, and cleaning the diamond knife. 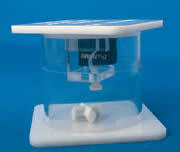 Has a soft silicone base, anti-slip pads underneath, and a clear plastic, hinged dust cover for storing glass knives. Holds 10 6.4mm glass knives. Measures: 6⅛"(L) x 2-9/32"(W) x 1½"(H) (115mm x 58mm x 37mm). Please see Ultramicrotomy Aid Tools. Emery paper which is glued to a wooden handle. 11" long x ¾" wide (279 x 19.1mm). 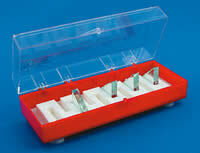 Very useful for filing excess resin of sample block tips. Grit size ranges from number 4/0 (finest) to 3 (coarsest). A plastic handle, 10½" (267 mm) long, holds strips of emery paper or cloth 11" x 1" (279 x 25.4mm). Strips are easily replaced. Comes complete with 2 strips/set (grit 120 and 240). Please see listing in Tweezers, Micro-Tools, and Gadgets. Silver coated polyester tape, ⅜" width, 72 yards long, 3" core; good for making glass knife boats. Please see the complete listing of Environmentally Safe Dust-Off Products.